Rent an electric bike and run during during the time that you want through Madrid at your own pace. Electric Bicycle has pedal-assist, so it will be easy to move around the city with a lightweight and easy-to-drive vehicle.Discover the nooks and the green promenades in this city without haste and strain and by your own means designing your own route. Get an electric bike and enjoy at your own pace, alone or in company of your friends, your family or your co-workers, the advantages of going by cycle in Madrid but helped by his small electric battery, that will make the experience fabulous and so comfortable. The e-bike works as a normal bike but with an useful electric assistance. While pedaling you feel that an acceleration help you so much especially going up the hills. Once you try you will realize It would be impossible living the rest of your life without that amazing form of transport. Relax and enjoy your ride and the wonders that the city and its gardens have to offer, walk through the streets, corners, with this vehicle of sustainable energy and that is friendly to the environment. 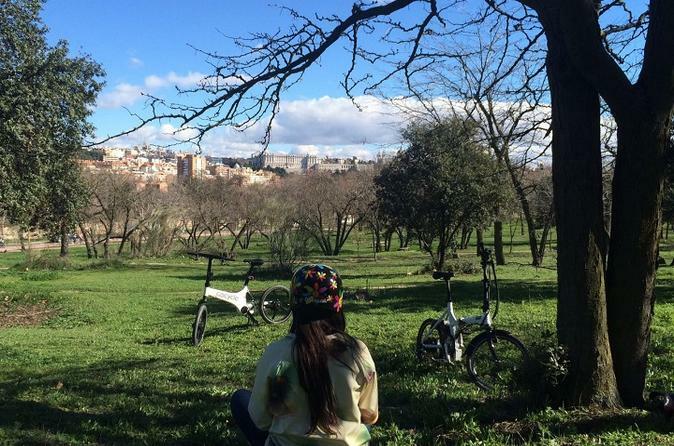 Madrid offer many different options to enjoy your riding, particularly in the parks of the city. Casa de Campo park, for instance, is equipped of many cycle lanes miles and with its 1722,06 hectares of width Casas de Campo Park is the biggest Park in Europe. From the heart of the city, take your time and start your adventure of exploring in a comfortable vehicle each and every one of the places that you've been dreaming to visit.